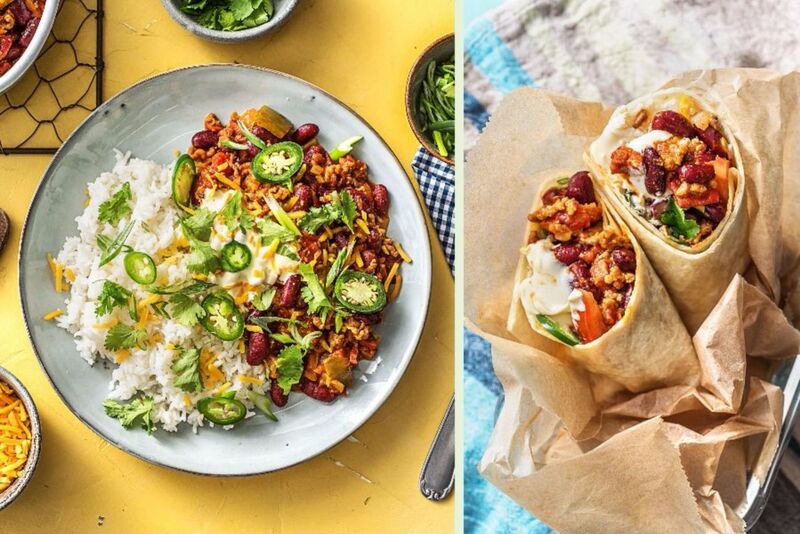 This one was from a past HelloFresh box and I loved the idea of having leftovers to make into a burrito for lunch the next day! One thing I will say is that when it comes to chili and soups, their portions are humongous! Come take a peek and see if you want to give this recipe a go as well... it's worth it! The only things I changed here was that I added all of the jalapeno to the cooking portion with the meat and beans and I left out the scallions. 1. PREP. Wash and dry all produce. Bring 1 1/4 cups water and a pinch of salt to a boil in a small pot. Halve, peel and finely dice onion. Drain and rinse kidney beans. Core and seed poblano, then cut into 1/2-inch squares. Thinly slice scallions, keeping greens and whites separate. Slice jalapeno into rounds, removing rib and seeds first for less heat (I kept them in because BRING THE HEAT). Cut chorizo into small cubes. 2. COOK RICE AND BEEF. Once water is boiling, add rice to pot. Cover, lower heat, and reduce to gentle simmer. Cook until tender, about 15 minutes. Meanwhile, heat a drizzle of oil in a large pan over medium-high heat. Add beef and half the enchilada spice, breaking up meat into pieces. Cook, tossing, until browned and cooked through, about 6 minutes. Season with salt and pepper. 3. COOK VEGGIES AND CHORIZO. Remove beef from pan and set aside. Heat a drizzle of oil in same pan over medium-high heat. Add onion, poblano, and scallion whites and give everything a toss. Stir in chorizo and remaining enchilada spice and cook, tossing, until veggies are softened, 4-5 minutes. 4. SIMMER CHILI. Stir stock concentrate, beans, crushed tomatoes, and 1 cup water into veggie mixture in pan. Bring to a boil, then lower heat and reduce to a simmer. Stir in beef and continue simmering until thick and saucy, 5-10 minutes. Season with salt and pepper. Fluff rice with a fork, then season with salt and pepper. 5. SERVE CHILI. Divide half the rice between bowls or plates, then add half the chili to the side. Dollop with 2 tbsp sour cream and 1/4 of the cheddar cheese. Garnish with scallion greens and a few jalapeno slices (to taste). Tear half the cilantro leaves from stems and scatter over top (save a bit of everything for lunch. When packing for lunch, slice tomato into rounds. Divide tomato, tortillas, and remaining sour cream, cheddar, chili, rice, jalapeno and cilantro between lunch boxes, keeping everything separate. When you're ready to eat, warm chili in microwave. Spread sour cream on one side of tortilla, then fill with ingredients and roll it up!